Pictures of books are a thing. Actually, they have been for a while now. Pictures of books have evidently been a thing since at least the summer of 2014. Collective Lifestyle’s article, Social Media Meets Book Nerds With Bookstagram, introduces the phenomenon, but says there were already 150,000 bookstagrams on Instagram by then. So, being in love with all things book-related as I am, I thought I’d try my hand at making a bookstagram. I’ve made two, actually, and they’re up on my Instagram account, shared to my Twitter feed, so I apologize if you’ve already seen them. Quirk Books just posted a neat article on July 21 entitled, How to Photograph Your Books for Instagram, in which are lots of good tips for creating appealing bookstagrams to entice followers and grow your audience. Pointers like making sure there’s no messy background, and adopting a unique quirk or characteristic so people will recognize your signature style. Book Riot’s article, A Brief Guide to Bookstagram, gives us “the scoop on all the hottest bookish hashtags” in case you haven’t yet taken the plunge yourself. And if you have made your own bookstagram, check out the article anyway, and maybe you’ll discover some new book-delights! Scrolling idly through my Twitter feed, I came across a post from Random House Canada announcing another Isabel Dalhousie mystery being released on July 21. Well! Who is Isabel Dalhousie, and should I know about her mysteries? A quick Google search confirmed that YES, I should know about her. Why? Because she is an amateur detective in Edinburgh. That was all it took (along with quite a few very positive reviews online) for me to add Alexander McCall Smith’s Sunday Philosophy Club books to my To Read list. And then I realized that his Isabel Dalhousie books join Alan Bradley’s Flavia de Luce mysteries, The Cat Who mysteries by Lilian Jackson Braun, and the Birder Murder Mysteries by Steve Burrows in my list of books that I would like to read. There’s a theme here, I thought, and decided to share these series with my readers in keeping with my quirky, unusual reading suggestions. The first series I really embraced as an adult was Elizabeth Peters‘ Amelia Peabody mysteries. These books combine everything I’m interested in: Victorian England, Egyptian archaeology and murder mysteries. Who could ask for more? Even though the first book in the series was published in 1975, they are still for sale on Amazon.com and I highly recommend them for light, enjoyable reading with some ancient history as an added bonus. I have to admit, the Birder Murders by Steve Burrows look delightful, but I have not yet read them! I just purchased A Siege of Bitterns the day before yesterday, and am wrapping up the book I’m currently reading before I start it. Again, the books feature an English detective, and with the addition of birding! As someone who delights in nature and loves birds, I can’t wait to read these books, as they also have great reviews. The Cat Who mysteries do not have an English detective in them, but they do take place in a very quirky fictional town and the protagonist has two wonderful cats who help him solve each book’s mystery. Alan Bradley’s youthful amateur detective Flavia de Luce is adorable and precocious, and basically defines the word quirky. Set in 1950s England with a cast of lovable characters, Falvia always finds the culprits with her usual panache. One thing I especially enjoy about this series is that Flavia and her family don’t age – or they do very slowly. In the first six books she is eleven years old, and I find that when authors let their characters grow older, they have to discard scenarios or surroundings and events that occurred in the earlier volumes. And if those were the scenarios, surroundings and events that readers enjoyed, then it’s difficult to keep up the level of appeal. All that aside, though, I truly enjoy these books and hope you will pick one up if you haven’t already! My newest find is Alexander McCall Smith’s amateur Scottish detective, Isabel Dalhousie. However, once I started looking into Ms. Dalhousie, I also stumbled upon the No. 1 Ladies’ Detective Agency, which sounds like another gem, and yet another series I need to explore! Although the settings are Edinburgh (certainly close enough to my fondness for English settings) and Botswana (not very English, but tea is mentioned in the teaser! ), the protagonists sound endearing and lovable and I expect to enjoy these treasures over many cups of tea to come. For my readers who have children, I thought I would do a quick post about some books that I loved as a child, and that still speak to kids today. The vibrant colors and rhyming words are perfect for engaging and entertaining very young readers. For ages 3-7: Richard Scarry books. One of the my earliest memories is from his book, The Great Pie Robbery – a classic caper sure to captivate every reader! For readers of all ages: Bill Peet stories. My personal favorite? Big Bad Bruce. But every one of them is a delight from cover to cover, both for the heart-warming story and the illustrations. I hope you enjoy these books as much as the little readers in your life do! Bibliotherapy is a concept that was brand new to me two and a half years ago when I began my degree in Library & Information Science. But after writing a short paper on its pioneer, Sadie Peterson Delaney, it is now a subject dear to my heart. Bibliotherapy has not yet reached its full potential. It is far from mainstream, and the average person on the street has never heard of it (please correct me if I’m wrong!!). 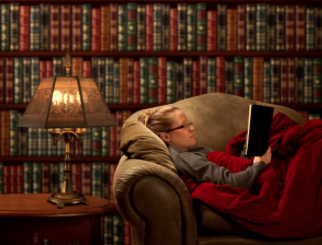 But, there have been some articles written about it, and here is one from the BBC, published on January 6, 2015: Bibliotherapy – Can you read yourself happy? The Verve Academy: Bibliotherapy – A Novel Cure to Stress is a good article about a practicing bibliotherapist, Ella Berthoud. Mark’s Daily Apple wrote a good article on the concept entitled, Bibliotherapy: The Power of Books in 2011. So when you’re feeling stressed or if you think you might benefit from some therapy, don’t rule out bibliotherapy!